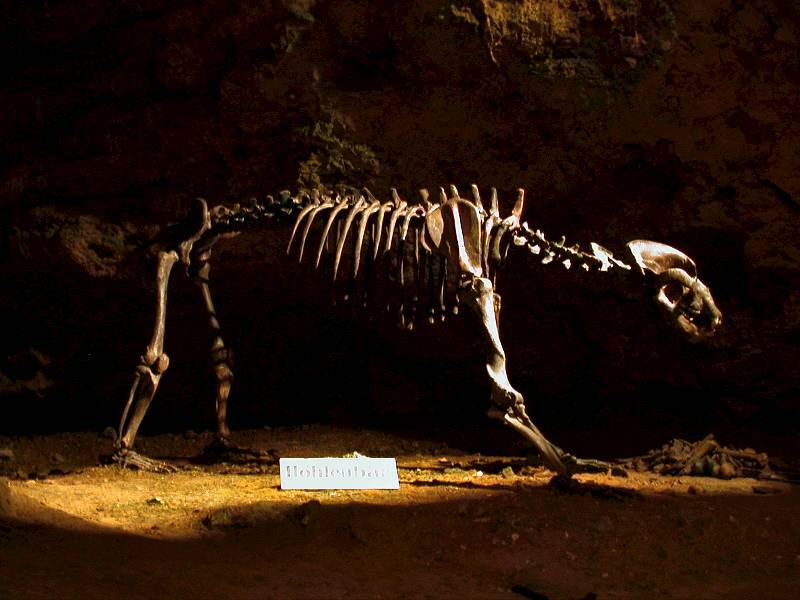 Image: a cave bear skeleton, found and on display in the Teufelshöhle (Devils Cave), Germany. 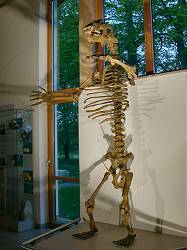 Image: a cave bear skeleton, upright. Reconstruction in the Speleologic Museum Laichingen, Germany. 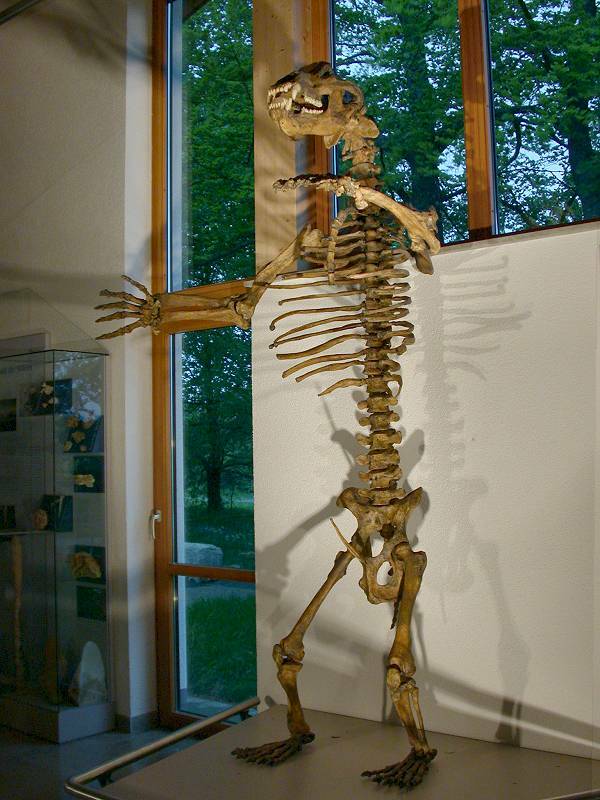 The Cave Bear (Ursus spelaeus Rosenmüller, 1794) lived in Europe during the Middle to Late Pleistocene. The cave bear is a close relative of the brown bear, both evolved from a common ancestor, the Ursus arctos, about 1.2 million years ago. He became extinct during the Würm Ice Age (24,000–10,000 ybp). 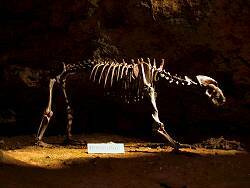 The scientific name Ursus spelaeus derives from the fact that so many cave bear bones were found in caves. A huge number of caves all over Europe contain massive remains of cave bears. In Europe, the bones found in caves are mostly from cave bears, much less from other animals and only very few from other bears. In several show caves the re-assembled skeletons of bears are on display. Cave bears were named in the Fränkische Schweiz (Frankonia Switzerland), a cave rich area of Bavaria, Germany (see Frankian Jura). Many of the caves in this area contained bones, and there were several people interested in natural science researching in this area. Johann Friederich Esper described the first cave bears in his book Ausführliche Nachricht von neuentdeckten Zoolithen unbekannter vierfüsiger Thiere, und denen sie enthaltenen, so wie verschiedenen andern denkwürdigen Grüften der Obergebürgischen Lande des Marggraftums Bayreuth, mit vierzehn illuminirten Kupfer-Tafeln in 1774. The extremely long title means something like Newly Discovered Zoolites of Unknown Four Footed Animals in Caves of Frankonia. At this time scientists still believed in the bible and Esper was theologist and palaeontologist. Extinction was unthinkable, except as a result of the deluge, probably, so he interpreted them as polar bears. This was a big advance, before the bones were interpreted as apes, canids or felids, or even dragons or unicorns. Many dragon caves and unicorn caves in Europe are actually bear caves. Only twenty years later, Johann Christian Rosenmüller, an anatomist at the Leipzig University, gave the species its binomial name Ursus spelaeus Rosenmüller, 1794. He found the main differences between this species and other bears examining a skull from Frankonia, from the cave Zoolithenhöhle. This original skull was lost during World War II, but there are many pictures of it published. The main difference between the cave bear and the brown bear of today is the size: the weight of cave bears could be up to 1 ton (1,000kg), his shoulder height was 3.50m, which is about 30% bigger than the brown bear. An easy way to see if it is a cave bear or a brown bear is the skull. The forehead of the cave bear is higher and steeper than that of the brown bear. Cave bears used caves for many purposes: they hibernated there in winter, gave birth to the young and sometimes died in caves, mostly during hibernation. Actually the enormous amount of bones is a result of the long time they used the caves. Even if only one bear died inside a cave per century, after a few 10,000 years there were hundreds of skeletons in the cave. So the cave bear is not a cave animal, he belongs to the trogloxenes, spending only part of his life cycle in caves and returning periodically. The cave bear was a herbivore, his food were herbs, grass, berries and the honey of wild bees, but sometimes he hunted small animals. The maximum age of cave bears was about 20 years. Cave bears developed about 250,000 years ago, this is the age of the oldest bones which were classified as cave bear bones. The time of extinction is not really clear, some books say 30,000 years ago, others only 8,000 years ago. It seems many of the found and dated remains of cave bear bones end around 24,000 ybp. The cave bears lived over millennia and then became extinct, for reasons we actually do not understand. Common theories are changes in climate, extermination by humans, some disease, or even genetic decline. At the begin of the Würm glacial, the so-called "last Ice Age", the forests shrunk drastically and the reduction of the cave bears main source of food could have lead lead to its extinction. Howerver, they survived other glacials before. This time also corresponds with the appearance of modern man in Europe, and those hunters may have hunted bears, competed with them for food resources, and used their caves thus blocking them from hibernating there. Even the visit of caves by man during winter may have disturbed the bears in hibernation and thus caused a higher death rate. Kurtén, Björn (1972): The Cave Bear. Scientific American 226(3):60-72.